tea | Oh, The Glamourous Life! Besides making costumes, I also indulge in embroidery and other handwork. When I have time. Which, sadly, is not as often as I’d like. I have a big basket of unfinished projects, and every now and then I buckle down and complete one, as I did last night. A what?, you ask. Trapunto is an Italian quilting technique that involves extra stuffing in the design elements to get a dimensional effect. It’s very time consuming. This is the front, which was hand-quilted and stuffed. The back is a simpler version of this design, which was machine-quilted and has no trapunto work (it was never going to be finished if I had to do two sides by hand). A tea cozy, for those poor unfortunate souls who have never been to a proper tea, is like a winter coat for your tea pot to keep the contents nice and warm. This is a traditional style of cozy that sits over the pot, like an over-sized hat. To the right you can see a different style of cozy, which was knitted by my doting mother. One can pour the tea without taking the cozy off. Sometimes it’s known as a “bachelor’s cozy”, presumably because men are too busy or lazy to remove a cozy or that’s a woman’s job or some other Victorian nonsense. One project down! Many more in progress. However, The Expo and other events loom close and I fear my embroidery time has come to an end for now. One of the many things I do at The Expo is host an afternoon tea party. It’s a nice way to relax on Sunday afternoon after all the craziness of the weekend and recharge before the Sunday night shows. 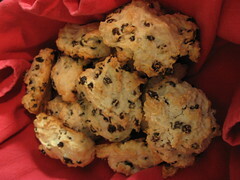 We have a variety of teas, finger sandwiches, scones, and little pastries. The food is provided by the hotel, of course, but we bring in the tea from generous sponsors. Brigitte Bisoux is my co-hostess and in charge of finding said generous sponsors. This year MEM Tea Imports provided us with half a dozen different kinds of tea for the party and many little samples for the attendee goodie bags. In fact Runa was so generous with the bottles, that we had quite a few left over. We’re selling them at B.A.B.E. and all the money will go to make next year’s tea party even better! One of the things I wanted for this year’s party was decorations on the tables and Mimi Mischief was happy to make cute centerpieces with a Valentine’s theme. Since both of my hostesses from last year desperately wanted to take Perle Noire’s class just before the party, I sought someone to help me set up the party. Blaze, The Red Rose of Texas, answered the call, tea apron at the ready. She was invaluable at getting the tea prepared and especially in keeping the pots refilled. And here’s the whole staff, product placements in hand. Just a few fashion notes: Brigitte is wearing yet another of her ridiculous hats and a vintage, reversible apron from my collection. Blaze is wearing a vintage hat, dress, and tea apron. I’m wearing a fascinator by Cristal Blu and an apron of my own creation. And no make-up — I was tired at this point and it really shows. Mimi is displaying one of her centerpieces. On Sunday afternoon, after the conference is over, but before the evening’s show, I host a little tea party. This year my co-hostesses were Brigitte Bisoux and Mimi Mischief. I don’t think we took any photos which is a shame because we were freaking adorable with our full skirts and aprons. I made the aprons Brigitte & I wore out of fabric with a tiny print of wee teacups and they tied with pink satin sashes, but Mimi, a costuming student, wore one of her own creations. The party was sponsored by Jacqueline Hyde Emporium, who provided all the tea and made it possible for us to have yummy little sandwiches, scones, and tiny cakes. Jacqueline herself had a family emergency and couldn’t attend, which made me so sad, as I’m sure people would have been snapping up tea from her right & left. It’s a nice way to relax and socialize after the intensity of the weekend and to get ready to enjoy The Newcomer’s Showcase. Please vote for The Boston Babydolls once a day every day! Voting closes on Friday! Last night I was tired and didn’t feel like cooking a feast for one. I decided to have high tea instead of supper. High tea is *not* the fancy meal with the dainty sandwiches and little cakes. That’s “afternoon tea” or (although nobody calls it so) “low tea”, because it’s taken at a low tea table. 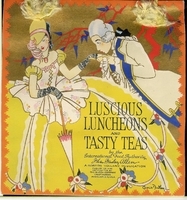 High tea is in the early evening, usually taken by those too tired and hungry to wait for the late hour of dinner. It’s high, like “It’s high time we had something to eat”. Also, because it’s eaten at a high dining table. High tea dishes are often hearty, but I tend to think of it as quick comfort food, often on toast. Welsh rabbit (or rarebit) is toast topped with cheese sauce and then broiled. Sort of like cheese fondue without the dipping part. I don’t care for it because the sauce is made with beer, which is not to my tastes. Take 2 slices of bread and toast them very lightly. If they’re slightly stale, you can skip this. Put the bread on a baking tray and pour a little red wine over each slice. Just enough that it softens the bread, but not enough that it gets soggy. Dot the bread with a little butter and toast it again. In a saucepan, melt together some cheese, a little butter, a spoonful or two of sharp mustard, and some more wine. The proper cheese for this is a sharp cheddar, but we didn’t have much, so I used mostly mozzarella with a little cheddar for flavor. The sauce should be thick. * Another high tea sort of dish — toast, spread with anchovy paste and topped with soft scrambled eggs. It’s something I would never eat, but I can appreciate the whimsy of the name. I’ve mentioned before my great love of tea. Let’s talk a little about that favorite topic today, particularly some on the items one needs to make tea. These are both tea. On the left is tea from a Lipton tea bag — I don’t drink it, I merely keep it on hand for tea-dying. It’s basically dust. On the left is some good quality loose tea. In this case, Earl Grey from MEM Teas (sponsor of my tea party last year at The Expo). Look at those lovely large leaves. That’s the one I want in my pot. This is a tea kettle. It’s used for boiling water. And the water should be boiling for black tea. There are different guidelines for green teas and for herbal infusions (they’re not tea, but that’s an epistle for another time). This particular kettle whistles, which is nice & cheery. This is a tea pot. It’s where the tea is brewed. This pot is ceramic, which I prefer over metal. I do have a silver tea service, but that may be a story for another time. Warm the pot first by swishing a little hot water around it and then pouring it out. Add your tea. Pour the boiling water on top of the tea and let steep for a few minutes (how long depends on the type of tea). Some say to use one spoonful of tea per cup and one for the pot. I find this makes a very strong brew and prefer less tea in my pot. This is a tea pot wearing a tea cozy to keep the contents warm. My mother knit the cozy for me. Isn’t it charming? This is called a bachelor tea cozy, because one does not have to remove the cozy to pour. Apparently Victorian bachelors were lazy. 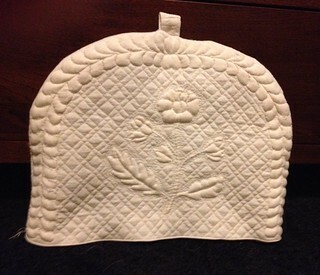 Other tea cozies look like quilted hats and cover the entire pot. There are some mighty whimsical tea cozies out there too. A tea filter or sachet. It’s like making your own teapot-sized tea bag. Scoop the loose tea into the bag and seal it shut. Easy! A tea spoon. Excellent for making a single cup. Fill with tea, close and stir into a cup of hot (and by hot, I mean boiling) water. There are also tea balls. Similar to the tea spoon, only it holds more tea. Use a little tea for one cup or a lot for a pot. Mine appears to be camera shy. A tea strainer. I love this one. Put the tea loose in the pot. Set the strainer across the mouth of a cup and pour through it. It will catch the leaves, leaving you with a clear cup with just enough tea leaves to read later. And the tea left in the pot doesn’t get bitter sitting on the leaves. Tea can be drunk with sugar and milk (never cream) or lemon. Never milk and lemon or you get a nasty curdled mess in your cup. Personally, I like just lemon, no sugar, which is why I prefer a lighter brew. I’ll be throwing a tea party again Sunday afternoon at The Expo. We’re still finalizing the details, but it looks like Jacqueline Hyde will be sponsoring the party and providing the tea! Today’s Friday Tip combines two of my favorite things — costuming and tea! You can use tea to dye white elastic so it is closer to your skin tone. Obviously you want to use black tea here. Your favorite herbal blend* is not going to have the same effect. Use a couple of cheap tea bags (the sort I’d never use to make anything I was going to drink) to brew up a strong cup and drop in your elastic. Make sure to stir the elastic around so it dyes evenly. Keep an eye on the color of the elastic as it’s soaking and remember that when wet it’s about 2 shades darker than when it dries. * not actually a tea, but that’s a message for another time. The past weekend was The Great Burlesque Exposition of 2012. It’s awfully hard to come back to reality after such an amazing weekend, so I’m going to try to prolong the delight by telling you all about it in little bites. Todays bite is about parties! Every day of the Expo there’s a special event (besides the shows, classes, and exhibit hall). It’s hard being a glamour girl all day and night — we need a chance to unwind! Friday night is Naked Girls Reading where we get Naked Girls from all different chapters — this year we represented Boston, New York, and Toronto. You can read all about it at the NGR Boston blog. Saturday night there was a pool party with fabulous surf music from The Waveriders. Everyone was dancing or swimming or dancing while swimming (hi Babydolls!). We loved the surf version of “Bad Romance”! More about the Expo to come!